It looks like another competitive multiplayer game. 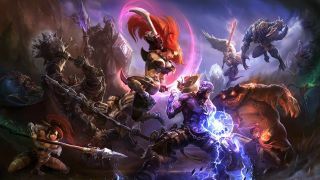 Riot has filed several trademarks for Legends of Runeterra, covering everything from clothes to software. The trademarks, of which there are nine in total, were filed in the middle of October this year. They’re broad, but the safe money is on a new game and lots of merchandising. Runeterra is the name of the world where League of Legends takes place. It could be a spin-off, maybe even a TV show or film based on League of Legends, but the trademarks cover a wide range of things. Spotted by Redditor zileanpredicts, they include “live competitions featuring video games”, which isn’t surprising. Maybe Riot isn’t happy with just one successful esport. This is accompanied by another trademark for Legends of Runeterra specifically for broadcasting or streaming games. Another mentions card games and trading cards for games. There was a wee bit of speculation at PC Gamer HQ, and I’m quite partial to Pip’s suggestion: Pokémon Snap spliced with League of Legends. Poro Snap. If it’s not that, maybe it should be. Take notes, Riot. Whatever it is, I hope it’s accompanied by Riot taking a long, hard look at both its community and how it treats its employees, especially in light of the gender discrimination suit. It would be much easier to get invested in a new game if combating toxicity, for instance, was a priority from the get-go. I’ve reached out to Riot for more details.